After more than a decade of orbital assembly, the International Space Station was finally ready to host its full six-member crew in May 2009. The Russian Soyuz TMA-15 spacecraft, scheduled for launch on May 27, 2009, would carry three additional crew members to the station during the mission designated 19S. 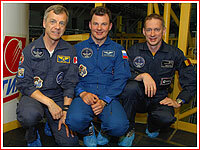 Russian cosmonaut Roman Romanenko, Canadian astronaut Robert Thirsk and European astronaut Frank De Winne would join in orbit three of their colleagues, who arrived to the station onboard Soyuz TMA-14 at the end of March 2009. Frank De Winne Flight engineer* ESA (Belgium) *Arrives as flight engineer, assumes command of Expedition 21 in October 2009. European astronaut Frank De Winne's mission to the station was planned in accordance with an agreement between ISS partners, which allocates 8.3 percent of the outpost's resources, including crew time and power, to the European Space Agency, following the arrival of the continent's Columbus laboratory. 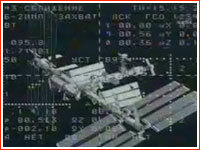 It translates into a six-month mission onboard the station every two years. With the presence of Canadian and Japanese astronauts onboard the station during the expedition 20, all participating agencies will have their representatives on the ISS for the first time. During the Space Shuttle visit to the station, 13 people will be occupying the orbital facility. During the transfer period from Expedition 20 to 21 in October 2009, three Soyuz vehicles would be at the station for the first time. 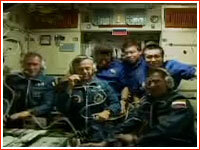 ...as well as the installation of the second exercise treadmill dubbed "Colbert" for three additional crew members. 2009 Nov. 10: The launch of the Mini-Research Module-2, MIM-2, from Baikonur. 2009 November: Soyuz TMA-15 with Romanenko, Thrisk and De Winne to return to Earth. 2009 May 15: The primary and backup crew arrives to Baikonur for the familiarization training onboard Soyuz TMA-15. 2009 May 16: A final crew familiarization training onboard the Soyuz TMA-15 spacecraft at Site 254 in Baikonur. On the same day, technical management of RKK Energia made a decision to proceed with fueling of the Soyuz TMA spacecraft for flight. 2009 May 18: The Soyuz TMA-15 spacecraft loaded with propellant returned to Site 254 for final integration. 2009 May 21: Soyuz TMA-15 after final inspection is inserted inside its payload fairing. 2009 May 23: Soyuz TMA-15 is transferred from Site 254 to the Site 112 for integration with the Soyuz FG launch vehicle. 2009 May 24: Soyuz TMA-15 is integrated with the Soyuz FG launch vehicle. 2009 May 25: The Soyuz FG launch vehicle with the Soyuz TMA-15 spacecraft was rolled out to the launch pad at Site 1 in Baikonur on May 25, 2009, as scheduled, however its installation onto the pad in vertical position was interrupted for several hours by strong winds reaching 25 meters per second in the area. The operation was resumed at 16:00 Moscow Time and was completed around half an hour later. 2009 May 26: The State Commission formally confirmed the Soyuz TMA-15 crew and confirmed the readiness of the vehicle for the mission. A fresh expedition is heading to the International Space Station, ISS, Wednesday, with the goal of expanding the crew of the outpost from three to six. 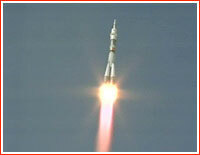 The Soyuz FG rocket lifted off from Site 1 at Baikonur Cosmodrome on May 27, 2009, at 14:34:53 Moscow Time, carrying the Soyuz TMA-15 spacecraft. Ten minutes after the launch, the Russian mission control center in Korolev confirmed that Soyuz TMA-15 had reached its orbit successfully. 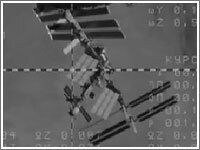 The Soyuz TMA-15 spacecraft docked to the nadir (Earth-facing) docking port of the Zarya control module of the ISS, on May 29, 2009, at 16:34 Moscow Time (7:34 a.m. Houston Time), just couple of minutes ahead of schedule. At the time, two spacecraft were flying over southern coast of China. The touchdown took place slightly more than three hours after undocking of the spacecraft from the International Space Station at 06:56 Moscow Time. The braking maneuver of the spacecraft had been initiated at 09:26:02 Moscow Time and lasted 259.9 seconds, mission control in Korolev said. According to the Russian space agency, Roskosmos, low clouds, fog and danger of icing at the temperature minus five degrees C grounded helicopters of the rescue service. As a result, only ground-based vehicles participated in the recovery of the crew. Rescue personnel reportedly observed the descent of the crew module of the Soyuz TMA-15 spacecraft and found it in vertical position at the touchdown site. According to the head of Roskosmos at the post-landing press-conference, communications between the rescue teams and the Soyuz TMA-15 crew had been established prior to the touchdown of the descent module. 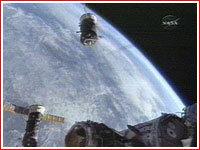 It was the first return of the Soyuz vehicle to Earth in December, since the landing of the Soyuz TM-10 in 1990. The crew's mission lasted 187 days, 20 hours and 41 minutes. With the departure of Soyuz TMA-15, only two people - NASA astronaut Jeffrey Williams and Russian cosmonaut Maksim Suraev -- remain onboard the ISS. The pair would be joined in orbit by a three-member crew of the Soyuz TMA-17 spacecraft, scheduled for launch at the end of December 2009. The Soyuz FG rocket with the Soyuz TMA-15 spacecraft, shortly after its installation on the launch pad on May 25, 2009, with Russian, Canadian, Belgian and Kazakh flags on the foreground, with first three representing countries sending its citizens into orbit and the fourth of the nation hosting the launch. Click to enlarge. Credit: RKK Energia.